The infamous baby shower! This really was the best party I had planned – and it was for me! Planning my baby shower was very fun. I got to pick and plan everything myself. The balloons, the sweets, the cake!!! and my favourite part – the registry list. Oh the registry list. As I never had a wedding party (yet) this was the first registry list I got to make and it was sooo good. But before we jump into the registry list…let’s take it a step at a time! We weren’t going for anything too big just a few close friends of the family. We also decided we weren’t going for the conventional “ladies only” type of party and would make it a mixed party. Other halfs were invited too. So the guest list (even though I did want it to be bigger = more presents #sorrynotsorry) was done. Next I created the registry list with John Lewis. I first found all the items I actually need and some that I want i.e. that would be good to have as opposed to must have. Then I went through the list like a hundred times to cut it down to the necessities plus a few cute and nice items. I included items that were both affordable and some that were more “splurge” in case my guests felt very generous. I chose John Lewis because I trust in their products and their customer service is very good as well. On this occasion I wasn’t disappointed at all. The registry department were on point and very attentive. They called me a few times to ensure everything was fine, I received update emails with the products that were purchased and products that were out of stock. You can use them to create your wedding list, baby shower, anything really. The way the list works is you select your party date, the registry list closing date and the delivery date. I decided to close the list 2 weeks after the baby shower date itself to allow any latecomers to purchase a gift. My delivery date was a week later. The countdown was real. If you want to know what Baby and Nursery essentials I included in my registry list, give the below posts a read! Next I took care of the decorations. 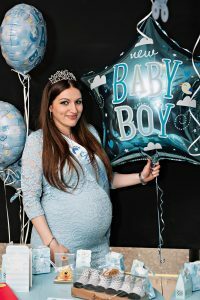 First thing I did was Google pics of boy baby showers to gather up some ideas of what I would like. And there were many many MANY pics. Next I Googled websites of companies which sold baby shower decorations in the UK to gather some more ideas plus prices to compare against. If I found something I liked I would then look for them on Amazon and eBay. In the end ended up buying from eBay (USA) – quite the pound saver site in my opinion. Have been a strong eBay purchaser for a while. Even though once I got into blogging more I moved onto Amazon for my everyday essentials. But that’s a blog post for another day. If you would like me to find some links for you for the items above just leave a comment or contact me – I’d like to think I am very good at finding cute things for parties. Honestly been sooo interested in getting into party planning. This was my first go at this and quite successful. If anyone needs any party planning advice would be glad to help. Just ask! I’m sure I could do virtual party planning too if needed. Next, my mum (an amazing professional chef) planned the menu. Being Armenian (with Russian background) our banquet spread was a mixture of Russian, Armenian and Georgian cuisine. The food was plenty, full of variety and delicious! We set up a banquet style dinner spread with a variety of starters and mains. I really liked the way the whole table decorations turned out – what do you think? 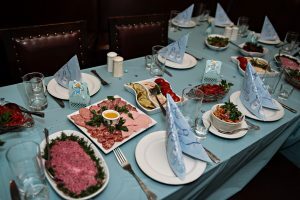 If anyone is interested we have a family run Russian, Armenian and Georgian restaurant in London (since 1994) and we do everything from simple dinners, takeaways, deliveries, birthdays, weddings, karaoke, events etc. 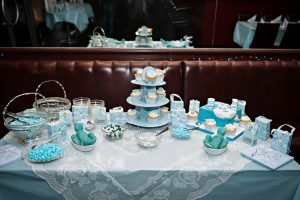 This was my favourite part of the baby shower: the dessert table. I went a little crazy I think but oh well, it looked very cute and was so delicious. I bought so many different blue-coloured sweets (haribos, chocolates and hard candy) and searched all over the internet for blue macaroons. The macaroons were very hard to find. Some places didn’t do them in the blue I wanted, some were too expensive and some just didn’t do delivery when I needed. I finally found a company who could do what I needed and I was happy. They arrived on time and tasted sooo yummy and I was a very happy mummy. I found a very lovely lady who makes cakes at home and can create pretty much anything you ask of her. My order was a little pricey but maybe not for what I received (I am not sure because it’s my first event and cake). She was easy to deal with, fast and very attentive. 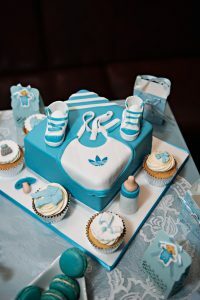 I ordered an Adidas baby blue cake (as shown in the picture below) and also some very cute baby shower cupcakes. When I went to pick up the cake she said she threw a few extra cupcakes in for free. They were soooo delicious. Vanilla sponge, cream and yummy icing. I love icing. They were so yummy that I didn’t want to share the cakes with anyone. They not only tasted good but looked great for the pictures. My guests really loved them. The cupcakes even had cute edible baby decorations on them. All in all we had a fantastic baby shower. Downside was that I couldn’t drink or party lol. We didn’t play any baby shower games, but still everyone had fun. 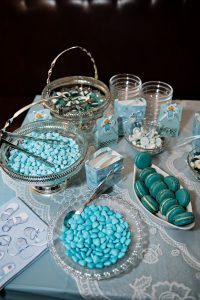 I included some party favours with cute little blue bits and bobs and sweets for the kids. The pictures came out great and we got a lot of cute gifts including a baby bath, baby booties, baby clothes and of course most of the items I had chosen on my registry list. I really want to take this party planning to the next level…hopefully I will. 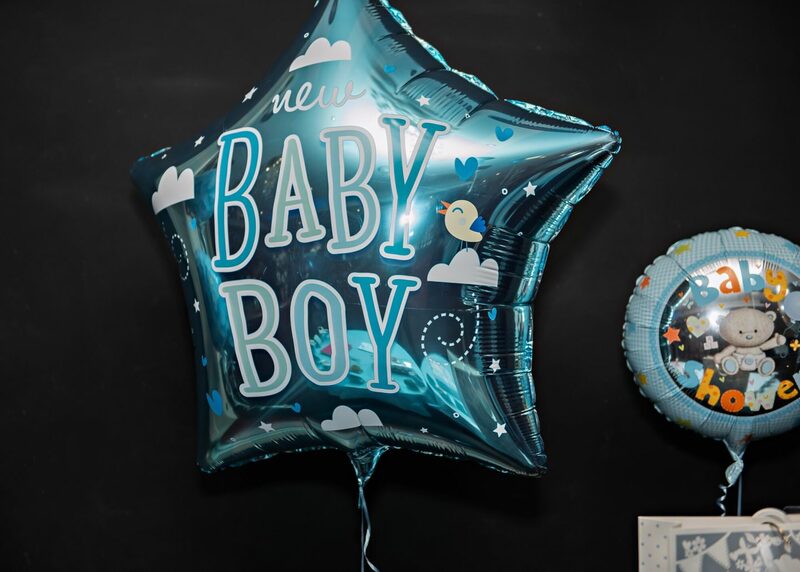 If you are anything like me and want a printable PDF with a detailed breakdown of how to plan the perfect baby shower, just leave your details below to receive your FREE copy straight to your inbox! What baby shower tips do you have for other new mamas?